by Dan Germain, VP, Chief Financial and Information Officer, The Credit Valley Hospital as published in Canadian Healthcare Technology Magazine | Vol.12, No. 8 | Nov/Dec 2007. According to recent statistics from the Canadian Institute for Health Information, as many as 24,000 Canadians die each year from adverse events like surgical errors, patients receiving the wrong medication, and hospital-acquired infections. As the practice of medicine today is inherently dependent upon healthcare technology, the accountability and sustainability of our healthcare system depends on the ability of healthcare practitioners to find ways of gaining efficiencies and increasing effectiveness in every aspect of their daily activities. All levels of government across Canada are experiencing pressures today to cut healthcare delivery costs, while increasing the level patient safety and care. With this demand for managed care, technology is quickly evolving to meet new and more complex requirements, with significant benefits to medicine and healthcare overall. As Charles Darwin so aptly identified: “It is not the strongest of the species that survive, nor the most intelligent, but the one most responsive to change.” In the past, the acquisition of technology was viewed as the answer in and of itself. Decisions about technology and usage were typically driven by the question of how to improve the effectiveness of what hospitals were already doing. However, today’s information systems should be viewed as a vehicle to transform current hospital processes into what they could and should be doing. At the same time, there is a demonstrated understanding for the need to update technology systems in order to extend a national electronic health record (EHR) in Canada. Healthcare stakeholders agree that technology is critical to facilitating necessary information-sharing across disciplines and venues. Driven by Canadian Health Infoway, this movement embraces the need to evolve healthcare informatics toward a more open, standards-based, patient-centric model that brings together all imperatives: clinical, administrative, financial, managerial, and human resources. With the information-sharing capabilities provided today by a rapidly expanding number of new technologies, Canadian healthcare organizations can leverage a crucial tool-set to support informed medical decisions at the point of care. To this end, healthcare providers and vendors both agree that a consistent, standardized way to share information between healthcare stakeholders can overcome the barriers to attaining an EHR. When any healthcare organization sets out to extend a ‘cradle-to-the-grave’ EHR – readily accessible via the Internet and linked to clinical protocols and guidelines — most people picture only one scenario. In this scenario, a user enters a patient query into one computer system, and that query goes to one source where all the patient information has been stored in a single “centralized” database, or vertical architecture. The system searches one database and returns the queried information to the user. 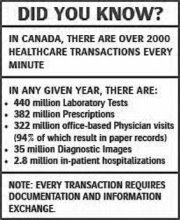 The problem with this scenario, is that information is not best accessed in this manner as the required patient data resides somewhere in a disparate system. However, this is not the only option. Instead of duplicating that patient data in a new centralized system, the healthcare organization could leave the existing data in place. Then, when the user enters a query about a patient, the system logically gathers the appropriate patient data from wherever it is stored. This approach is called a “federated” database model and employs a horizontal architecture. Anyone who uses the Internet takes the delivery of content from multiple systems for granted. Almost every Web page is automatically assembled from multiple sources, and employs a federated database model. One simply clicks a button and data is retrieved from disparate databases and servers. By definition, a federated database is a collection of data stored on multiple autonomous computing systems connected by a network that is intuitively presented to users as one integrated database. Additionally, using a federated portal approach allows bandwidth, hardware, administration, and other infrastructure costs to be distributed over time, keeping pace with the development and deployment of the facility. This can significantly reduce networking and system-interfacing costs and opens up a number of added functional possibilities by extending data to the organization’s value chain delivering clear, tangible benefits for your short and long term needs. Compared to a centralized portal, today’s federated architecture can achieve equivalent or better results, at a fraction of the cost and time. The Credit Valley Hospital (www.cvh.on.ca) is a vibrant community hospital providing leadership in the delivery of primary, secondary, and tertiary health care services to the people of Mississauga, Ontario and the surrounding LHIN-6 region. Serving more than 5,400 visitors daily, The Credit Valley Hospital (CVH) has provided patients with access to cutting-edge medical research, programs and treatment since 1985, recently opened a new Ambulatory Care Wing that offers both systemic (chemotherapy) as well as radiation therapy as a regional Cancer Centre. By 2011, CVH will have completed another expansion adding 145 new inpatient beds to the community. . As such, it’s not surprisingly to imagine that the 2,700 staff and nearly 400 physicians generate and store a significant amount of disparate data. CVH recently implemented a MEDSEEK Web solution which facilitates various healthcare organizations to support vendor-neutral and enterprise-wide system interoperability. Due to the regional programs at CVH, it was critical that all departments were able to share data amongst its providers. The goal was to be able to provide the same information sharing capabilities among various healthcare facilities, nation-wide, as well as reduce redundancies like test duplications due to missing or unavailable information. After implementing the federated portal, CVH saw an immediate improvement in both patient flow and medical care throughout the hospital. Today, patient-data is immediately available from any computer with Internet access, whether the disparate data actually resides at the two sites (Etobicoke and Brampton) of William Osler Health Centre (www.williamoslerhc.on.ca) or at the three sites (Oakville, Milton, Georgetown) of Halton Healthcare (www.haltonhealthcare.com). The population served by these portals exceeds one million people residing in Mississauga, Brampton, Halton Hills, and Oakville. Agfa Healthcare’s Clinical Dashboard™ (powered by MEDSEEK) is the only proven federated portal model in the country that addressed CVH’s unique pain points in an efficient and cost-effective manner. The portal met the organizations rigorous selection criteria by offering superior software and services, clinical integration experience, and the ability to expand to future enterprise eHealth solutions. The combination of ease of use, real-time data access and enhanced clinical functionality enhances patient care and clinical excellence, while extending a virtual EHR. In addition, the solution was implemented in only 90 days – at a fraction of the cost for a centralized portal solution – which was vital. Jeff Lamb, Executive Vice President of Sales at MEDSEEK confirms those sentiments: Enhanced integration functionality throughout a medical enterprise yields immediate operational efficiencies including reduced paperwork, improved communications, better workflow management, and stronger relationships among clinicians, patients and the community. For CVH specifically, having connectivity to William Osler and Halton Healthcare facilities, the portal provides a virtual medical record of all patient data across multiple LHINs. This not only improves physician efficiencies but also contributes to enhanced patient safety and care. The federated portal solution evolves Canada’s healthcare delivery toward a more open, standards-based, patient-centric model, at a fraction of the time and cost of the centralized portal approach. CVH expects this solution to significantly reduce surgical and medication errors while making lives easier for staff. Additionally, as CVH expands its portal solution to support PDAs, the portal will become even more valuable as patients will be able to ask their physician specific questions and have results available immediately. 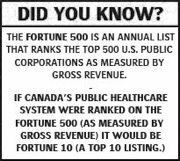 Ultimately, however, the biggest winner is the Canadian patient and taxpayer. There’s no argument about the need for a better way to access information, reduce medical errors and increase the quality of patient care, and that technology plays a critical role in making this happen. However, using technology the way it’s always been used is not the best approach for the kind of radical change needed. Through examples like CVH, it’s clear that interconnectivity and information-sharing between hospitals, LHINs, and even across provinces is a reality, and can significantly benefit from a new, “federated” way of thinking.